Xilinx Virtual cable (XVC) is a TCP/IP based protocol which emulates JTAG protocol and acts like a JTAG cable over network. Xilinx Virtual Cable provides a way to access JTAG chain on the target FPGA board and debug the target without the need of a physical cable. While it is designed to be used over network where USB or serial cables cannot be run directly, XVC can be used to access JTAG chains on Xilinx FPGA based boards connected locally with appropriate software to act as a bridge between XVC and the hardware. Thanks to [tmbinc] at http://debugmo.de/, such a software already exists that can bridge XVC with FT2232H based devices. Saturn Spartan 6 FPGA Module do have an onboard FT2232H device that can be configured to access the FPGA’s JTAG chain. This makes Saturn capable of working with tmbinc’s daemon for bridging XVC and FT2232H. 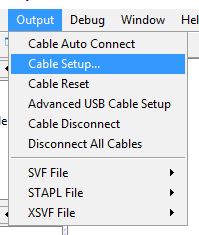 By properly configuring the daemon and XVC, iMPACT and Chipscope can be used with Saturn without purchasing an expensive Xilinx USB Platform Cable. Extract it to any location of your choice. We extracted it to ‘playtag-master’ in Downloads folder. Open command prompt and navigate to the folder where you extracted it. Connect the Saturn board to your computer using USB mini Cable. 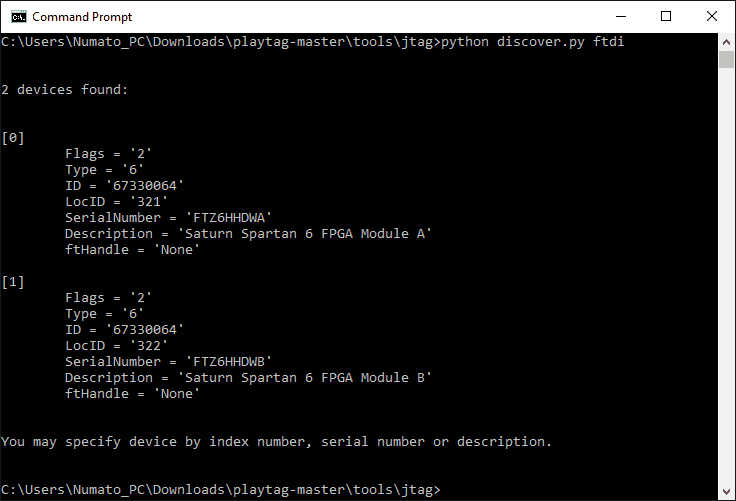 In the command prompt window we have opened, type and press enter: ‘python discover.py ftdi’ It will give an output something like the image below. Here we are seeing 2 devices because Saturn’s FTDI has 2 independent channels. But, it’s the first channel which is actually connected to FPGA’s JTAG lines. So we will be using Device . Now type and enter: ‘python xilinx_xvc.py ftdi 0’ Here 0 refers to Device  mentioned before. The output should be something like this now: Congratulations, our first step is done. Server is now waiting for connections from Xilinx Virtual Cable driver. Leave this command prompt as is (i.e, don’t close it) and let’s go to iMPACT now. 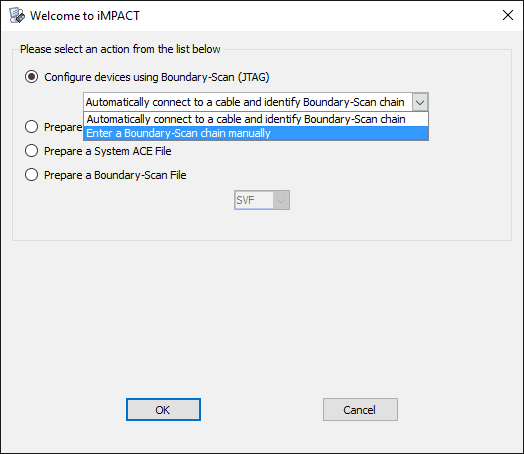 Now, you can go back to iMPACT, Right click and “Initialize JTAG chain”. It should show the FPGA present on the Saturn board. iMPACT will ask whether you want to assign configuration files (i.e, .bit files). Choose ‘Yes’ and browse to your .bit file generated by ISE after design implementation. Open the bit file. Choose ‘No’ when iMPACT asks about SPI or BPI PROM files and finally click ‘OK’. Right click on the FPGA icon showed in iMPACT and click ‘Program’. iMPACT should now begin programming the FPGA on the Saturn Board. Once done, it should show ‘Program Succeeded’ in blue. That’s it! 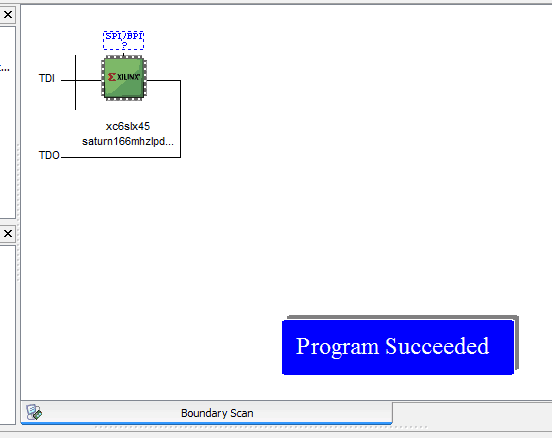 You have successfully used Xilinx Virtual Cable driver to program Saturn via iMPACT! Great job! Try using your Saturn with Chipscope too! Did you ever see strange visual effects in Chipscope when doing this? More often than not, I get waveforms which appear completely garbled, like channel data streams getting mixed together. Almost like some kind of synchronization problem. It’s extremely frustrating and I have not found a reliable way to avoid it. Don't miss out on new articles! Subscribe to get valuable insights.